Dexter Daily: Rewatching Dexter - 4.10 "Lost Boys", 4.11 "Hello, Dexter Morgan", 4.12 "The Getaway"
Rewatching Dexter - 4.10 "Lost Boys", 4.11 "Hello, Dexter Morgan", 4.12 "The Getaway"
Rewatching Dexter by DexterDaily. A look back at the past seasons of 'Dexter' and our favorite serial killer's victims. Today, we're going to remember the final three episodes of the fourth season: 4.10 "Lost Boys", 4.11 "Hello, Dexter Morgan", 4.12 "The Getaway". Hit the 'read more' button for more! Dexter finally believes he understands the beast known as Trinity. But when a ten-year old boy goes missing, Dexter is forced to question everything he's learned up to this point. It's a race against the clock. And with each step forward, Dexter has to confront the real possibility that he may have more in common with Trinity than he'd like to admit. Secrets abound — from Cody, who is forced to defend one of Dexter's lies, Masuka, who can't bring himself to confess what he witnessed at Thanksgiving, and Debra, whose recent discoveries force one of Miami's finest into making an impossible decision. Dexter's worst fears have been realized. Because of Debra's unrelenting pursuit, Miami Metro is just one step away from discovering the identity of the Trinity Killer. And Dexter can't let that happen. Arthur's arrest would not only deprive Dexter of a satisfying kill, it would also expose the secret life Dexter's been leading in his pursuit of this monster. Dexter must take drastic action to buy himself time to deal with Trinity in his own fashion. Meanwhile, Rita decides to confide in Dexter, which doesn't go as well as she'd hoped. LaGuerta and Batista's breach of ethics paints them into a very tight corner. And Arthur, who still can't understand why Dexter didn't simply turn him in, begins his own bloody investigation into Kyle Butler. Dexter's victim: Stan Beaudry. He bludgeoned a prostitute to death. Neck sawed out with power saw. 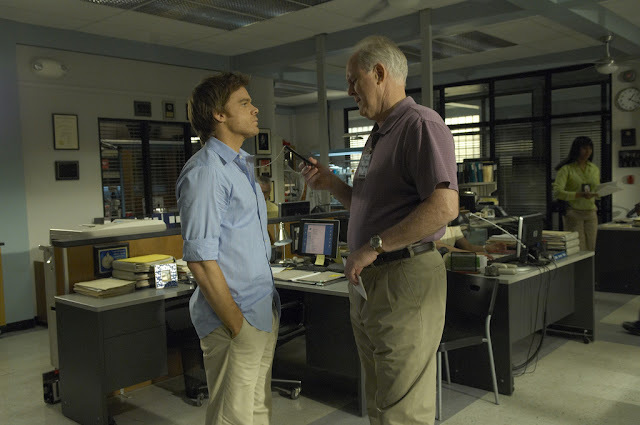 As the noose tightens, Arthur warns Dexter to back off. But Dexter will do anything to stop Trinity from eluding him, even if that means putting himself on the wrong side of the law. Rita acknowledges the rocky relationship she and Dexter share, but reaffirms her support. Batista and LaGuerta face the consequences of their actions. Debra unearths a deeply-hidden truth, but not one she expected to find. And ultimately, Dexter and Arthur find themselves on a collision course, leading them to a confrontation that will change their lives forever. Dexter's victim: Arthur Mitchell / The Trinity Killer. Beaten to death with his own hammer. Rita Morgan. Killed by the Trinity Killer. 4.12 "The Getaway". Season 4 Finale. Original Air Date: December 13, 2009.